Strengthen the momentum for several major procedural changes, including moving from an academic quarter system to a two-semester system. To begin building relationships, we held initial interviews with representatives from the various academic departments and staff units to learn about the challenges and opportunities facing the college and to assess the college’s readiness for change. Erik was interested in activating organization-wide support for change, and he knew of The Grove’s high-engagement processes and how they support alignment around change and solutions while cultivating the organizational capacity to realize them. Involvement is essential to culture change. After thoughtful deliberation with the dean and the associate deans, key formal and informal leaders from across the college were invited to join a design team. We held special design meetings and explored with them what a successful engagement process would look like. In these meetings, leaders experienced new ways of thinking and working together. They got to know each other as they expressed their wide range of concerns and aspirations and began to explore new possibilities. They were challenged to shift their mental frames, from thinking only on behalf of their departments and units to collectively thinking on behalf of the entire college. They challenged each other to step up to what the college needed now. Over time their interactions became more trusting, empathetic and direct, signaling that they were in this experience of change together. We hoped that these seeds of collaboration, innovation and change would be realized in their new leadership responsibilities, and that their work would set us on a path toward college-wide collaborative engagement. The design team invited faculty and staff to three all-day meetings and one half-day meeting over the course of six months, with a group of 50 – 60 participating. The first meeting focused on the case for change, current trends in higher education, and learning about important current functional activities and what these might foretell about the future. 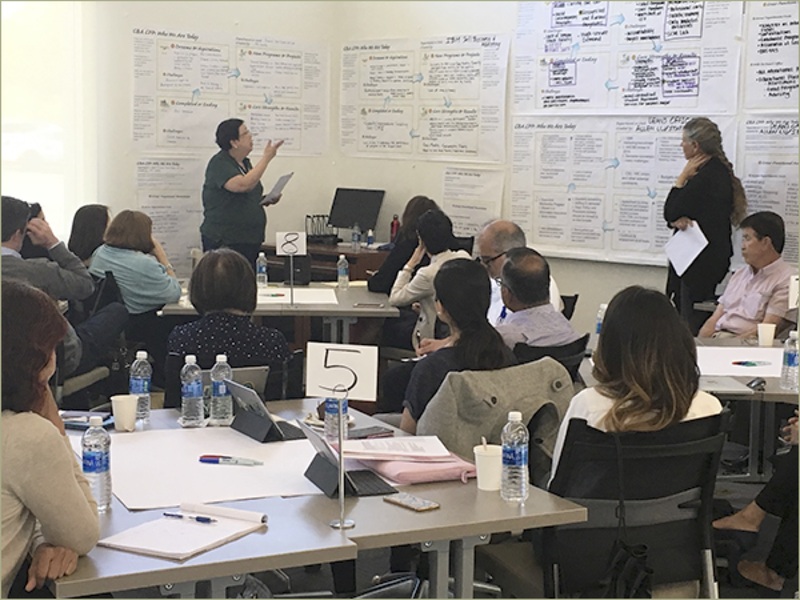 During the second meeting, we envisioned the future of the college in 2025, captured potential strategic initiatives, and—through a dialogic process—began to explore how the culture of the college may need to shift to realize the vision. For the third all-day meeting, the focus was on discovering a metaphor that would help tell the story of the change. An image of the college being at a crossroads emerged. 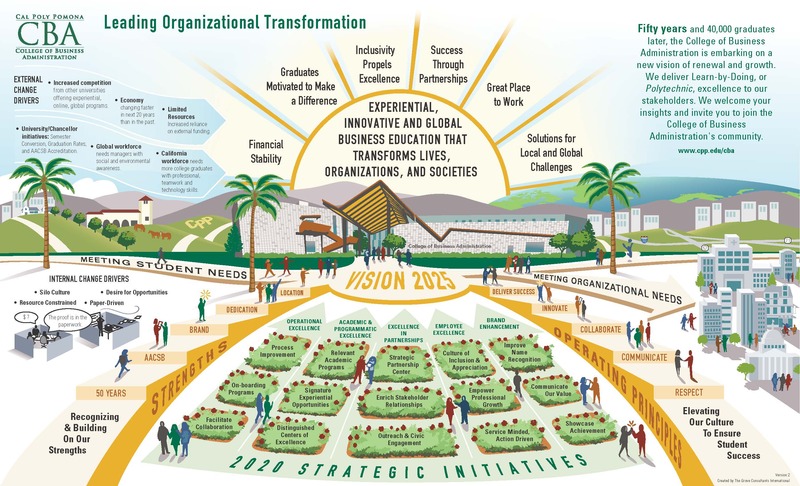 This became the central image for the vision map that was developed to support the work. The energy in these meetings was high. Staff and faculty were intentionally grouped together at tables to support sharing of information and perspectives across functions. Magnifying what already had been taking place in the design team, participants learned about the current priorities and interests of other units and departments. This created a sense of connection and “seeing the whole,” which many people said they had not experienced before. Their work together began to give them a sense of what might be possible if they applied this collaborative approach to other situations. The final half-day session was an all-college meeting with more than 110 faculty and staff present. 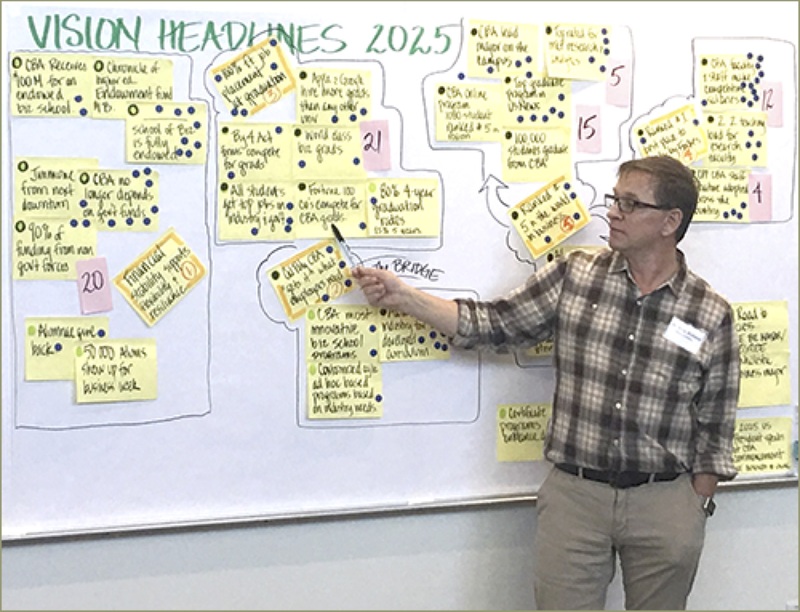 A draft version of the vision map was shared, allowing plenty of time to invite discussion and input for further refinement on all elements of the map. Throughout the process, Erik and the associate deans modeled being open to new ideas and creating an environment in which it was safe to think outside the box and take risks. It takes more than big meetings to guide culture change. In between the large group meetings, Laurie and I regularly met with the design team. We reflected on what we were learning and designed the upcoming activities and meetings with these insights in mind. A more inclusive and systemic organizational awareness and acumen emerged among the members of the design team that later led them to step up and formalize their association as the Strategic Action Group. They shifted from initiating and designing the change process to now actualizing the change, with pairs taking on the responsibility for leading each of the strategic initiatives. The dependable rhythm of these in-between meetings helped maintain overall momentum and focus in the larger arc of a change process—something that can be derailed when attention is pulled in different directions by other priorities. Part of the value of visual work is all the conversation it catalyzes outside regular processes. With Erik’s encouragement, the design team decided to display some of the large graphic wall charts created during the all-day meetings in the hallways of the college. This promoted much curiosity. Faculty and students who had not been involved previously were able to enter into the conversation about the future of the college and its culture. One class took it upon itself to share a document with the design team with its inputs about the strategic direction of the college. Shortly after our consultancy ended, we learned that the college had set up a “scrum room” in which the strategic-initiative leads come together each Monday morning to report on, streamline and integrate their efforts. The deans also decided midway through the project to redesign the layout of one of their larger meeting spaces, from an auditorium-style arrangement to a space that fosters collaboration. Erik also reported that he invited potential donors who were also former graduates of the college to lunch with him in a gazebo right in front of the college. A conversation ensued about the strategic initiatives, conveniently and graphically depicted on the laminated vision map that each guest received. On the spot, guests made donations totaling several million dollars to fund the creation of a Center for Innovative Analytics—a goal of one of their strategic initiatives. When plans transform into tangible results, new narratives begin to come alive. This day it did. In summary: shifting from ideas into action, from initiating into realizing, requires more than motivation and good will. Our client, the dean, had the foresight to support an engagement process that activated new behavior and empowered collaborative activity at the college level and across and within the various departments and units. The resulting vision map created a container and focus for the process. It continues to be used to communicate about the college and promote engagement and support for its vision. Special thanks to Tiffany Forner, The Grove’s art director, for her work on designing the vision map.